I first met Albert Tucker in about 1983 when I purchased one of his major paintings, Intruder and Parrots 1964-68 and we immediately hit it off. He was a great orator with a never-ending, fascinating repertoire on the history of the Melbourne art scene… from his perspective. We attended many art events together and I was delighted when he agreed to open my first John Perceval exhibition in 1988. Gould Galleries included his paintings in numerous significant exhibitions, notably The Angry Penguins: Boyd, Nolan, Perceval, Tucker in 1997. ROB GOULD. Albert Tucker left Australia bound for London in late 1947 and spent the next thirteen years living and working in Europe and America. Exposed to the art, history and rich culture of Paris, Rome, New York and other great cities during these years, he absorbed all they had to offer, experimented with technique and a diverse range of themes, synthesising and distilling these influences to develop his own distinctive style. For Tucker art was a vocation, and he held strongly to the belief ‘that to create easy and saleable art was merely an acquired skill, [but] to create challenging and culturally important art was the true purpose of the artist.’1 It was this uncompromising vision and Tucker’s determination to make art of substance that sustained and motivated him and which, toward the end of the 1950s, saw him achieve the acknowledgement he had long sought. A significant turning point occurred in 1958 when Alfred Barr, Director of the Museum of Modern Art, New York, saw examples of Tucker’s recent paintings in the stockroom of Poindexter Gallery on his regular weekend rounds of the city’s commercial galleries. Impressed by the strength and originality of what he saw, Barr recommended a purchase to the museum’s Board and the subsequent acquisition of Lunar Landscape, 1957 placed Tucker’s work in the company of the best twentieth century artists in what was arguably the most significant collection of modern art in the world. Although his practice was yet to be acknowledged in this way by any major gallery in Australia, this critical recognition of his art gave Tucker the confidence to persist and pursue his current direction. Success continued, and in the same year Tucker won the Australian Women’s Weekly art competition, famously receiving the news that he had been awarded the 1000 pound prize at a time when he had only a few dollars left in his pocket.2 A commercial exhibition in New York in 1960 resulted in the purchase of a second painting by MOMA and another being acquired for the collection of the Solomon R. Guggenheim Museum. Tucker returned to Australia in 1960 to participate in a major survey exhibition of his art of the past five years that was being organised by John Reed and the Museum of Modern Art of Australia. The exhibition was well funded and unusually for the time toured to every state (where it was shown in commercial galleries), as well as to regional galleries in Newcastle, Launceston and Mildura. John Reed wrote in the exhibition catalogue that ‘many artists, including Albert Tucker, have felt obliged to leave Australia because of lack of recognition, so it is with special pleasure that we welcome him back as our distinguished guest. Albert Tucker’s international reputation precedes him on this visit; but we can now for the first time see the paintings on which this reputation has been established.’3 Tucker had returned to Australia after his recent success in New York with his head held high and this exhibition brought due acknowledgment of his work in his own country, with paintings being purchased by private collectors and public galleries including the Art Gallery of New South Wales, Sydney as well as a feature article being published in Sydney’s Daily Telegraph. For some years Tucker’s imagery had increasingly focussed on Australian themes, subjects drawn from the country’s unique history – convicts, bushrangers, explorers – and others based on its distinctive landscape. The theme of the figure in the landscape had first become evident in the Ned Kelly series of the mid-1950s and by the time Tucker began painting his iconic antipodean heads towards the end of the decade, the figure had transformed and become the landscape. ‘I’d been away long enough to be suffering acute bouts of nostalgia and I was getting all these memory images of Australia – and oddly enough not so much specific imagery, but in images of texture and colour and light and all that kind of thing that’s very Australian, very rough textures.’4 His longstanding friendship with fellow artist Sidney Nolan, whose work had consistently addressed such themes with considerable critical and commercial success, must have influenced this development but so too did something more fundamental. Over time Tucker recognised that although he was living in sophisticated cultures with firsthand access to masterpieces of the Western art tradition, he was always at one remove from his surroundings. Despite the philistinism and stunted appreciation of true art and creativity that Tucker perceived in Australia, in this country he was literally at home, part of a community (no matter how much of an outsider he may have felt) and possessed an innate understanding of his environment. It took at least a decade of being away from the country of his birth for Tucker to come to terms with this and see Australia in a positive light and as a place that could both inspire and sustain a serious career. Tucker’s absolute confidence and utterly bold approach to picture-making is on clear display in Intruder and parrots, 1964 – 68, a major painting of the period that summarises many of his key concerns. In visual terms, colour is the dominant feature. In the background a brilliant yellow and orange glow emanates from the setting sun, transformed via broad brushstrokes into the colours of dusk towards the top of the painting. The parrots are also vividly coloured, but it is their attitude of aggression towards the figure in the painting that is more significant. 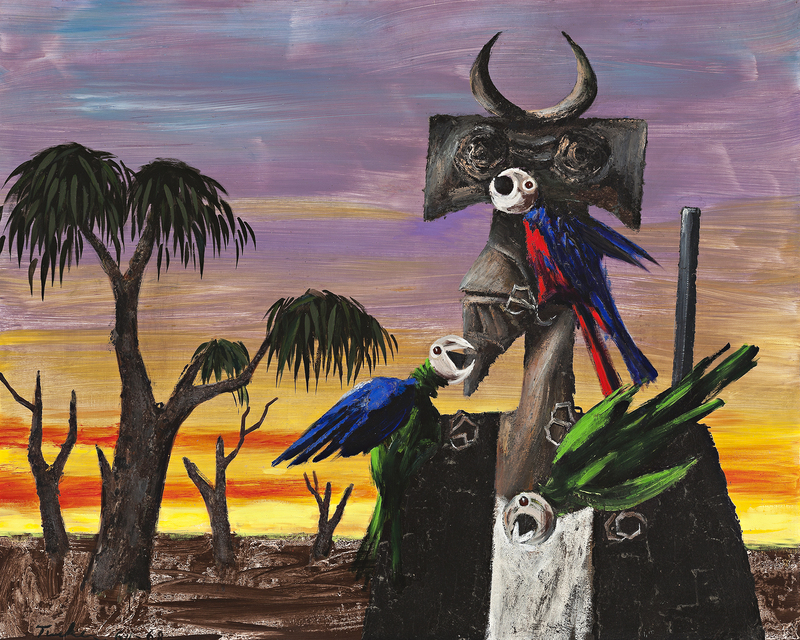 Explorers are often beset by parrots in Tucker’s work, a symbolic representation of their lack of familiarity with the environment that conveys something of the European settlers’ struggle against an alien landscape. In this picture however, the figure has become an intruder – horned, fearsome, devoid of colour and carrying a rifle – whose trespassing into territory where he doesn’t belong prompts the birds’ decisive response. With Tucker’s newfound appreciation of the Australian bush came an increasing awareness of the vulnerability of the natural environment, especially areas on the fringe of the city and the suburbs that were the focus of developers. Over time this awareness developed into activism, and in the 1970s Tucker bought land in the Queensland rainforest and other parts of the country in order to protect it and the rich habitat it provided from inappropriate development. In this light, Intruder and Parrots can be read as a powerful statement about the natural world and the need to protect and preserve it. A comparison of the present painting with a reproduction of the same work in Art and Australia reveals that Tucker reworked it after 1964, adding more foliage to the trees and filling in the intruder’s previously hollow eyes. It is tempting to interpret these changes as a toughening of Tucker’s stance on the environmental cause during the intervening years, the modifications adding to the beauty of the natural world as depicted in the painting and emphasising the ominous presence and potential of the intruder.